The Ramblings of Roxie Roulette: I Promise I Don't Buy It For The Packaging. I Promise I Don't Buy It For The Packaging. What am I talking about? Soap & Glory of course! The shops are now full of bath and beauty smellies adorned with retro photos of bathing beauties (I even saw some in Asda the other day! ), but Soap & Glory were the first. I think everyone has heard of this company since it's foundation in 2006, and most women (and men!) have owned at least one of their products. I have the slightest obsession with their products since I received Clean On Me shower gel and Righteous Butter moisturiser for Christmas in 2007, and I am now slowly working my way through their entire, ever growing collection. I've tried most of the beauty products, but I have yet to move on to their new make up range, so I won't say much on them, but from what I've heard and read the reviews have been great, and they're not too pricey either - I'd hazard a guess at them being within the same price range as L'Oreal, Maybelline and MaxFactor. So where do I begin? I think the shower is the best place. Presently, I have a miniature of one of my favourite of their products, the Clean On Me shower gel. It's a really thick formula that gets you squeaky clean and leaves your skin nicely moisturised without the need for a body lotion. The full 500ml bottle lasts me around six months and seeing as I shower everyday that's not a bad deal for just over a fiver! Once or twice a week I like to exfoliate my body too, at the moment I'm using Flake Away which is fragranced with shea butter (good for moisturising! ), sugar and peach; the full 300ml tub cost me £7.00 from Boots, and the mini was part of a gift set I got for Christmas - I get a lot of this stuff for Christmas! I have also given the Breakfast Scrub a whirl too, and was highly impressed, but it's a little more pricey for a little less product. I won't lie to you, I haven't used the Glad Hair Day shampoo yet, so I won't give my opinion, but once again, I have heard great reviews of their stuff. After my shower, I need to moisturise. My skin just goes all tight and nasty if I don't. I've been using Soap & Glory body butters since I was introduce to them way back in 2007, and I have yet to find a decent enough replacement. I get my regular supply every Christmas so have never actually needed to buy one, but the three tub collection shown below will probably last me the year. The Righteous Butter smells of their signature scent, similar to most of their products so blends well if you are also using their shower products. My personal favourite is the Butter Up body cream, which has thicker formula and more of a citrus scent, which is much more my thing. Finally the Daily Smooth body butter is the one I am making my way through at the moment as I have both a tube and tub of the stuff. It's the most flowery of the three scents, and probably my least favourite. For a little extra moisture I do like to use their Flirtigo Moisturising Mist which is a lighter moisturiser that is great for spraying the tops of my arms, which get very dry, in the morning if I don't want to use a heavier body butter. My favourite scent is the Glam-A-Lot body mist; it's a heavier scent, more perfume-y than a body spray, and it sticks around all day. The Mist You Madly spray is the same scent as the Daily Smooth body butter and so, like that product, is my least favourite one. I got these as part of a set, I think it was £20 for all three, but don't quote me. The great thing about these sprays is the fact that they're not in an aerosol, so not only do they smell nice, are in nice bottles with catchy names, they are eco-friendly(ish) too! Finally for the beauty stuff we have the odd and ends that I just have in my collection. Hand Food is a great hand cream that isn't too greasy and sinks into the skin pretty quickly, plus has that signature Soap & Glory scent to it. I actually use this as a face moisturiser in the summer too; I know you're not supposed to but it keeps my skin moisturised all day and it hasn't caused me any issues. I use Heel Genius after every shower because I have disgusting feel (to say the least), and it does make them soft on top, but it hasn't done much for the rough skin underneath; the smell is a little weird too, and it is slippery on your tootsies until it soaks in. I got this as part of a package, and probably won't purchase it again. Lastly is my least favourite product: Scrub Your Nose In It. I have yet to find a facial exfoliater that my skin likes, some are too heavy (Lush, I'm looking at your Salt Scrub) and some are too light. This one is certainly too light. It's supposed to clear out your pores around your nose and leave your skin silky smooth without causing damage. Well...it doesn't. My skin didn't feel any different, my pores weren't any clearer and the smell reminded me more of toothpaste than face wash. 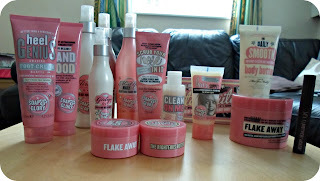 So, there you have it, my present collection of Soap & Glory products. I promise to update you on any new purchases as I do believe in promoting the products I think are best! Plus, I just got a new camera (hence the lovely photos) so I'll be snapping lots of things with no excuse not to share them with you!